Windows 8 includes a very useful feature for laptop users that lets you see the charging history and capacity of your battery. Over time batteries hold less and less of a change so this report is very helpful to identify if it is time to buy a replacement. 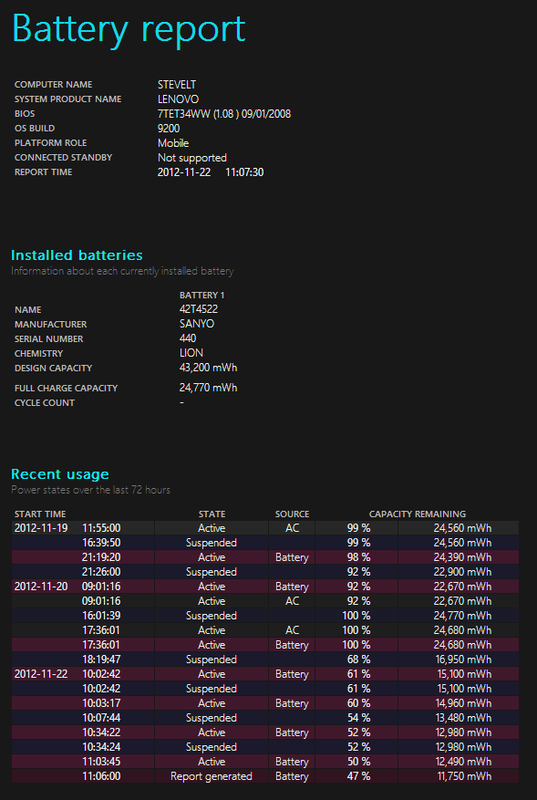 Generating the report is very simple, just open up a command prompt, type in powercfg /batteryreport and hit Enter. A report will be generated and saved as a HTML file to your users folder such as c:\users\steve\battery-report.html. As you can see from the chart above, my laptop battery had an original capacity of 43,200 mWh and now it only holds 24,770 mWh after a full charge. It is about time to buy a new battery.